Desmond Dornak, from the interview. 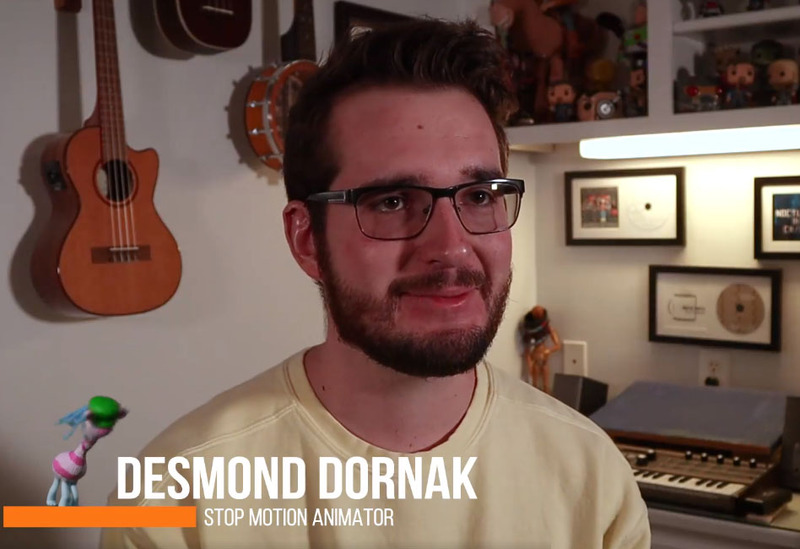 Desmond Dornak, graduated from the Electronic Arts/Animation program in 2017 and is living the dream making stopmotion animation for Dreamworks TV. He can be seen in this behind-the-scenes interview about a recent episode for the “Trolls Toymotion” series. The full, finished episode can be seen here. Desmond is freelancing with the Oklahoma City film studio Reckless Abandonment Pictures which was contracted for five episodes of the stopmotion series. As a student, Desmond had a special interest in stopmotion. It’s a technique that requires patience, persistence, and special care as the animator brings static objects to life by photographing them one frame at a time, and moving them meticulously and incrementally between shots. These individual photos are later stitched together and edited to make the final animation which captures the illusion of the object’s motion. In a complex animation, many objects are moving at the same time. In the behind-the-scenes video Desmond describes the problem solving that went into creating the shaving cream scene and how that was creatively and effectively engineered. Ask yourself – just how often does ‘shaving cream’ and ‘engineered’ appear in the same sentence? That and more are everyday occurrences for animators! The Electronic Arts program is an award-winning interdisciplinary program that stresses effective communication, storytelling and collaboration while fostering creative excellence and technical mastery in animation, sound design, music recording, interactive new media and film making. Electronic Arts is comprised of highly motivated students from the departments of music; art and design/animation; and media, journalism and film. The Animation program in Art and Design was ranked twenty-first in the top 50 public animation schools and colleges in the U.S. and thirteenth in the Midwest by Animation Career Review in 2015. The curriculum explores a variety of animation techniques in both 2D and 3D. Advancing through the classes, students are asked to hone their interests and develop a body of work to launch their careers.